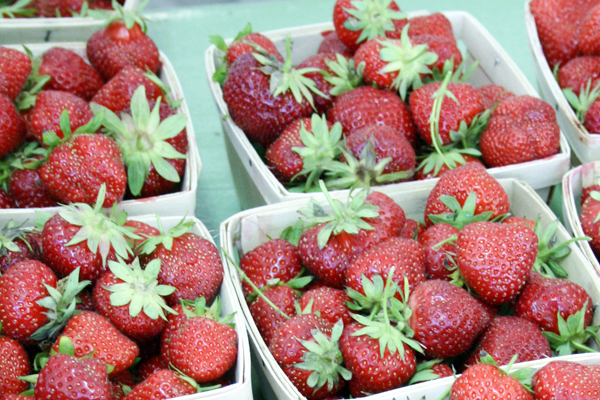 There are two tasty items that are in season at the farmers markets: strawberries and mint. Finding a use for strawberries is easy: they are fantastic for fresh eating, and there are countless strawberry recipes out there. In my experience, mint is one that stumps people as to how to use it. Sure, it can used in teas and as a garnish, but what about other uses of fresh mint? One way to use it is in beverages. This recipe for a strawberry mint yogurt smoothie is a great example of how mint can play off other flavors. In this case, it helps to enhance the strawberry flavor with something extra, and the yogurt gives it a nice creamy texture for a refreshing smoothie for those warm June days. Place all ingredients in a blender and run on puree until smooth. Serve immediately in tall glass. Please note: if you grow mint in your garden, it’s a good idea to be vigilant about its potential to spread. It can take over your garden, and it’s actually better to grow it in a container.